To celebrate the ending of 2012, I made a sachertorte. The only people allowed to claim the sachertorte are in Vienna, so instead of piping the traditional "sacher" on top, I used my own name. 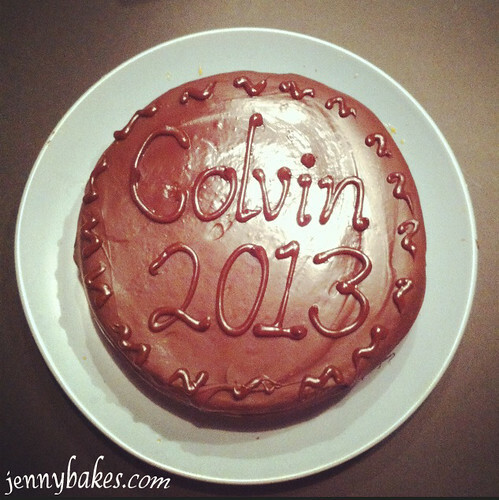 So I present to you - the Colvintorte! I used Lidia Bastianach's recipe on Foodandwine.com. The sachertorte is on the dry side. Everything I read said this is how it is supposed to be, and enjoyed with coffee and dunked in whipped cream. I'd made one ages ago, as a freshman in highschool, but I don't really remember how that tasted. I went with Lidia's recipe because she seemed to do more to try to remoisten the cake - using the traditional apricot jam as a syrup, a filling, and a glaze. I thought these ideas were sound and followed her recipe almost exactly. I baked the batter in two 9 inch cake pans and only had one layer of filling. I suspect her thin layers are one more method she used to combat that dryness! Technically, I could claim this dessert on my Around the World list, and I did recently read Rock Crystal, which was set in Austria. Done! 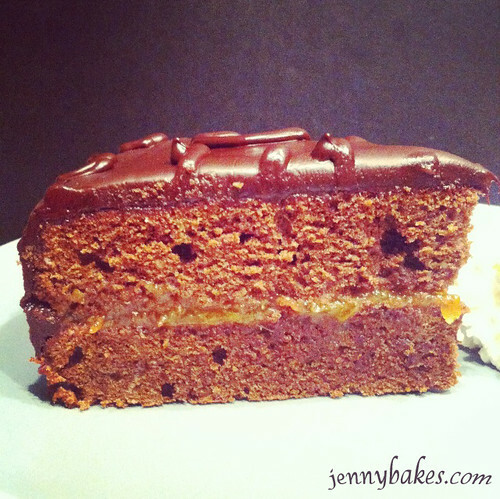 You can see some of the other recipes I pinned for sachertorte in my "baked goods to try" Pinterest board. The King Arthur Flour recipe was well laid out but the comments had several issues with the glaze. The Kaffeehaus recipe I'm sure would be ultra-traditional, but I was concerned about the dryness. Would I make this again? Probably not. I do love the flavor combination of chocolate and apricot, but I would prefer it in a much moister cake, or just by dipping apricots in chocolate. OMG I TOTALLY went there when I was in Austria in May JUST to each True Sachertorte. It is indeed a dry cake, but good. Not something I'd want all the time, or on my birthday, but worth seeking out if you are a tourist in Vienna!!! I'll have to send you the recipe I came across for it. It is a cake with a fun legend/history.